The first major piece of core stage hardware for NASA’s Space Launch System rocket has been assembled and is ready to be joined with other hardware for Exploration Mission-1. The forward skirt will connect the upper part of the rocket to the core stage and house many of the flight computers, or avionics. 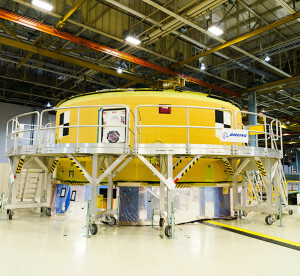 The first major piece of core stage hardware for NASA’s Space Launch System rocket has been assembled and is ready to be joined with other hardware for Exploration Mission-1, the first integrated flight of SLS and the Orion spacecraft. SLS will enable a new era of exploration beyond low-Earth orbit, launching crew and cargo on deep space exploration missions to the Moon, Mars and beyond. On July 24, forward skirt assembly was wrapped up with the installation of all its parts. As part of forward skirt testing, the flight computers came to life for the first time as NASA engineers tested critical avionic systems that will control the rocket’s flight. 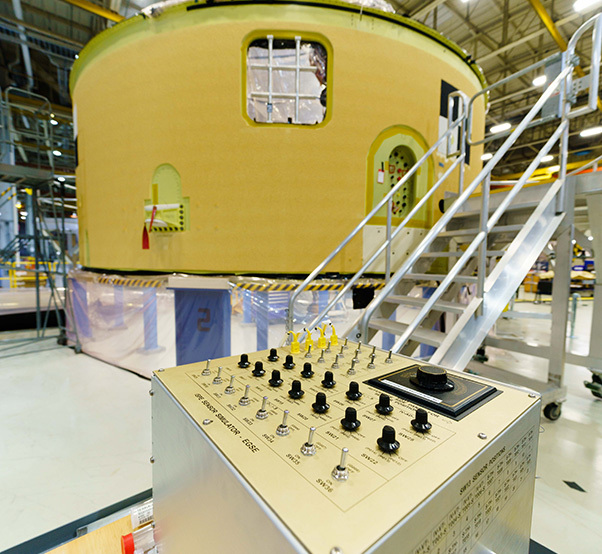 The construction, assembly and avionics testing occurred at NASA’s Michoud Assembly Facility in New Orleans. Located throughout the core stage, the avionics are the rocket’s “brains,” controlling navigation and communication during launch and flight. It is critical that each of the avionics units is installed correctly, work as expected and communicate with each other and other components, including the Orion spacecraft and ground support systems. The forward skirt test series was the first of many that will verify the rocket’s avionics will work as expected during launch. The tests show the forward skirt was built correctly, and that all components and wiring on the inside have been put together and connected properly and are sending data over the lines as expected. Located throughout the core stage, the avionics are the rocket’s “brains,” controlling navigation and communication during launch and flight. The forward skirt test series was the first of many that will verify the rocket’s avionics will work as expected during launch. The avionic computers ran “built-in tests” that Espy compares to the internal diagnostic tests performed by an automobile when first started. All of the health and data status reports came back as expected. The tests were a success and did not return any error codes. Such error codes would be similar to a check engine light on a car. The successful tests give the team the confidence needed to move forward with avionics installations in the core stage intertank and engine section. With more hardware and more interfaces, the installation in the intertank will be more complex, and the complexity will ramp up even more as the team moves to the engine section, introducing hydraulics and other hardware needed for the rocket’s engines. The forward skirt is now ready to be joined with the rest of the rocket’s core stage. Integration of the massive core stage will take place in two joins, the forward join — including the forward skirt, liquid oxygen tank and intertank — and the aft join — including the liquid hydrogen tank and the engine section. Engineers will perform standalone tests on each component as they are completed. Once the forward and aft joins are integrated, they will perform a final integrated function test, testing all the core stage’s avionics together. The fully integrated core stage and its four RS-25 engines will then be fired up during a final test before launch. At NASA’s Kennedy Space Center in Florida, the core stage will be stacked with the upper part of the rocket, including Orion, and joined to the rocket’s twin solid rocket boosters, in preparation for EM-1.